This links to an article in the Tampa Bay Times dated May 28, 2018 by Craig Pittman. A update on the disaster two years ago. Fertilizer giant Mosaic Co. is paying tens of millions of dollars to patch a central Florida sinkhole and monitor for hazardous runoff, an incident that has heightened environmental concerns involving an industry critical to the U.S. food supply. “This is a very unfortunate event and one we certainly wouldn’t have wanted to happen to us,” Mosaic Chief Executive Joc O’Rourke said in an interview this month. 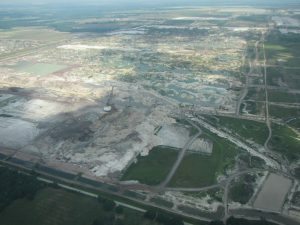 The 240-foot-deep hole opened beneath a pile of mining waste at Mosaic’s plant in Mulberry, Fla., about 30 miles east of Tampa, in late August and drained contaminated water into an aquifer that provides drinking water for communities as far north as southern Georgia. The company in early November said it would spend some $60 million to seal hole with concrete and pump the contaminated water out of the aquifer. Mosaic has also guaranteed Florida $40 million if it fails to take actions like plugging the hole and monitoring nearby drinking-water wells through 2018. The phosphate fertilizer that helped nourish the record U.S. corn and soybean harvests this year is made from mining millions of tons of mineral-rich earth. Environmentalists say the wastewater and towering mountains of refuse left behind by the fertilizer-manufacturing process take too big a toll. At Mosaic’s plant in Mulberry, millions of gallons of acidic water created during fertilizer production spilled into the aquifer, along with unknown quantities of phosphogypsum, a mildly radioactive fertilizer byproduct. “Phosphate production does enormous damage even when everything goes right,” said Bradley Marshall, an attorney at Earthjustice, a nonprofit environmental-law group. He said the porous limestone surrounding the local water table car easily allow pollutants to spread. “The Florida aquifer is like Swiss cheese,” he said. Mosaic said water in the aquifer moves slowly, allowing the company to retrieve the contaminated water before it flows off its property. Mosaic has had trouble with mining waste before. Last year, the company struck a deal worth more than $800 million with regulators to clean up hazardous waste from its operations in Louisiana and Florida. In September, residents near Mosaic’s Mulberry sinkhole sued to hold the company responsible for potential drinking-well contamination. Days later, Governor Rick Scott ordered Florida’s environmental protection department to issue an emergency rule requiring businesses and local governments to inform the public and the department within 24 hours of a pollution incident. Samples from more than 900 private wells nearby show no effects from the spill, the state environment department said. The Mosaic facility processes phosphate rock from a swath of central Florida known as Bone Valley for its fossil beds that harbor the mineral. Florida supplies roughly 70% of the phosphate rock for U.S. fertilizers. Manufacturing fertilizer leaves behind mounds of refuse called phosphogypsum stacks—or gyp stacks—which pockmark the landscape. Collectively, they cover thousands of acres and each can reach 500 feet high. “Each is a disaster waiting to happen,” said Beverly Griffiths, chairwoman of Sierra Club Florida’s phosphate committee. The Sierra Club implored the U.S. Army Corps of Engineers to freeze new mining permits until the industry’s effects are better understood. A sinkhole opened in 1994 under the same gyp stack in Mulberry, then owned by IMC Global Inc. Mosaic said the sinkhole was repaired at the time and that no other work was needed once they took over the facility. Mosaic said contamination didn’t escape the property then, either. Another Florida fertilizer maker, Mulberry Corp., filed for bankruptcy and abandoned a plant in 2001, leaving officials to pump wastewater onto a barge and dump it in the Gulf of Mexico. In 2009, another sinkhole emptied more than 90 million gallons of hazardous wastewater into the Florida aquifer, the Environmental Protection Agency said. Environmentalists said the latest breach validates their warnings about phosphate mining’s dangers. Some want more regulation. Some want to stop fertilizer production completely. Brian Birky, executive director at the Florida Industrial and Phosphate Research Institute, said the U.S. can’t do without the fertilizer mined there. Over the past half-century, the U.S. has seen an increase in the use of phosphate-based fertilizer as well as high-tech seeds and equipment, pushing crop yields ever higher. Mosaic’s Mr. O’Rourke said consumers benefit from the low food prices those yields make possible. He said U.S.-made fertilizer will be necessary to produce the calories to feed a booming global population. “If you want to feed eight to nine billion people, you have to do it using mined and manufactured fertilizers,” he said. He expects phosphate mining in Florida to continue for at least 40 more years. 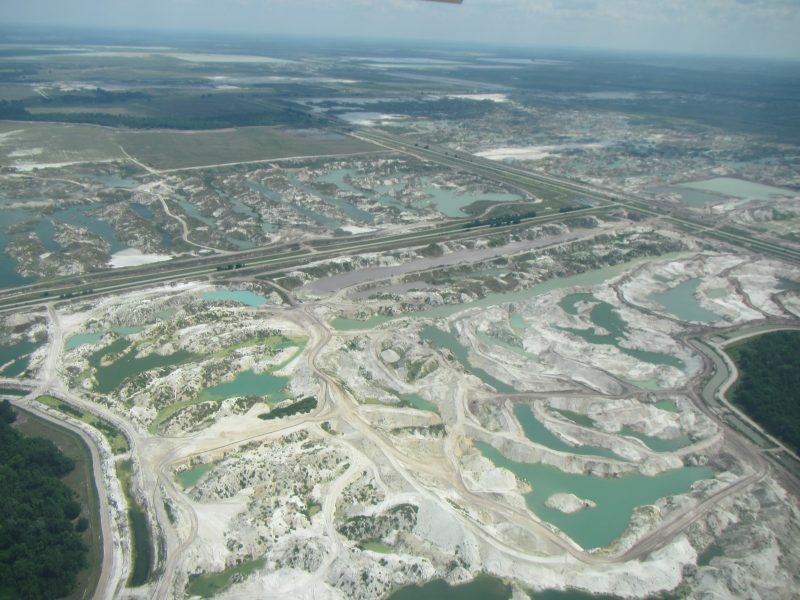 “The idea of 40 more years of mining in central Florida is revolting,” said Jacki Lopez, staff attorney and director of the Center for Biological Diversity in Florida. Mosaic officials claim that 215 million gallons of contaminated water was sucked down into the Floridan aquifer system through a massive sinkhole underneath their phosphogypsum stack at the company’s New Wales fertilizer plant in Mulberry, Florida. A closer look at both the evidence and Mosaic’s history suggest this shouldn’t have been much of a surprise. Mosaic officials first reported the breach to the public three weeks after they claim two workers—said to be monitoring the fluid levels in the stack—noticed the drop, indicating a problem. It was then, the company claims, that pumps were installed to retrieve the remaining fluid in the stack in search of the calamity’s origin. BARTOW — Mosaic Co. officials apologized Tuesday morning for failing to inform the public in a timely manner that contaminated water from its plant had been dumped into the Floridan Aquifer. The leak occurred after a 45-foot wide, 300-foot deep sinkhole opened under a gypsum stack at its plant in Mulberry. POLK COUNTY, Fla. (WFLA) — A massive sinkhole on top of a Mosaic gypsum stack near Mulberry allowed millions of gallons of contaminated water to flow into the Floridan Aquifer. Eagle 8 flew over the huge chasm in the earth and spotted a cascading waterfall in the middle of what looks like a moonscape. The is happening in the New Wales plant off Highway 640, south of Mulberry. The sinkhole opened up almost three weeks ago. Since then, about 215 million gallons of contaminated water have drained into the aquifer. The sinkhole is about 40 feet across. It’s depth is unknown. It sits right in the middle of a massive gypsum stack. Gypsum comes out of the plant after the company produces phosphate fertilizers and animal feed ingredients. On Aug. 27 workers monitoring water levels discovered a drop. “When it was first noticed, we installed pumping systems to move water out of that compartment on the gypsum stack, to recover the water,” said David Jellerson, Mosaic’s director of environment and phosphate projects. The water is contaminated with phosphoric acid and is slightly radioactive. Not all of it is being caught by pumps. You wouldn’t want to drink it, but so far, Mosaic engineers don’t believe the water is making it to private wells.